The Scarlett design by VIPA Lingerie, here shown in the form of a really feminine and delicate black lace bolero style jacket. The model is wearing the matching corset which is available to buy separately. This very pretty jacket is ideal for party wear as well as a lingerie accessory or a very glamorous little bed jacket. 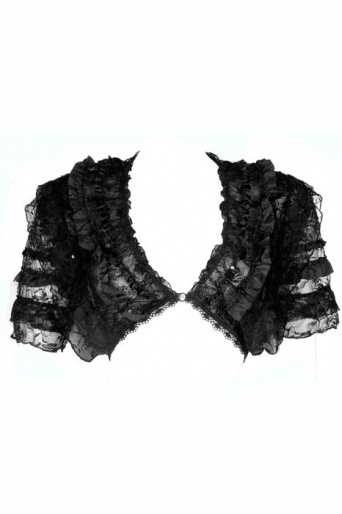 It is made from black lace decorated with frills of lace and satin. Short in style as in in a bolero jacket it fastens at the front just below the bust.